I have the time, so here's your note: Well done, dude! 'Twas another wonderful week for New Order share purchases. Xadace Nos'Lanos joined the elite ranks of New Order shareholderdom by purchasing 400 shares. 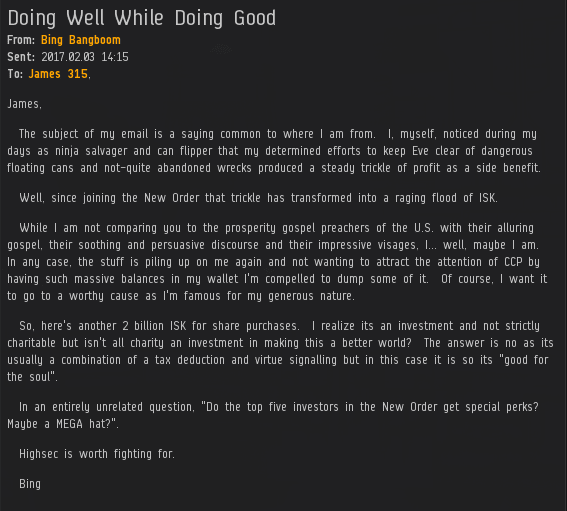 This sent us over the 1 trillion 108 billion isk mark and earned him a Supreme Protector's Tip of the Hat™. Super Perforator, already one of our top investors, increased her holdings with a purchase of 2,001 additional shares. This sent us over the 1 trillion 109 and 1 trillion 110 billion isk marks. A Double Supreme Protector's Tip of the Hat™ goes out to you, Super. Alexander Kirenski won some cash from a recent CODE.-sponsored contest and put it to good use, purchasing 1,000 shares of New Order stock. This sent us over the 1 trillion 111 billion isk mark and earned him a Supreme Protector's Tip of the Hat™. Gotta love those ganking contests! Bing Bangboom purchased 2,000 more shares and sent us over the 1 trillion 112 billion and 1 trillion 113 billion isk marks. He earned a Double Supreme Protector's Tip of the Hat™ and has caused me to give considerable thought to the "MEGA Hat" idea. If you look just beneath the surface, there are clearly signs of a rivalry between Bing Bangboom and Super Perforator. They're neck-and-neck in the shareholder race, with Bing currently edging Super out 27,650-27,096. You also saw this competition reflected in last month's Top Supporters list. But the best part is, whoever wins, we all win! The CODE always wins, always. Remember what I said earlier about ganking contests? Another one is about to begin. This time, it's Agent Dragunov Tyrsik organizing a Venture-ganking event. "But what about the prizes?" you ask. I'm way ahead of you. Today? Why, that's today! 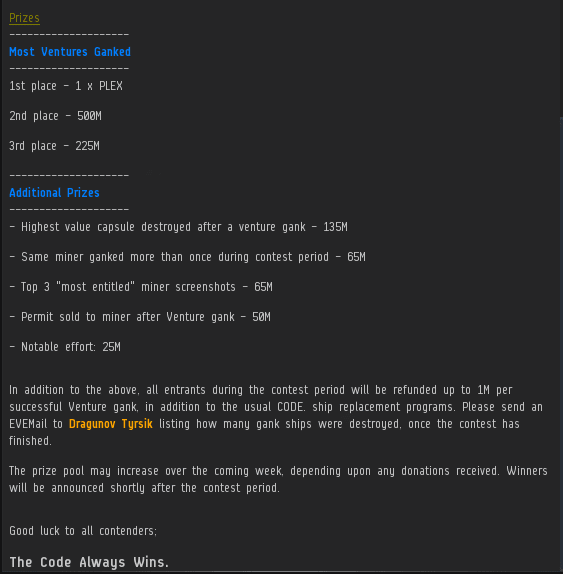 Get to it, Venture killers. Ventures, really?. You really have set the challenge for yourselves yet again. Its really bottom feeding sort of ganking. Trolling for tears, any kind will do. Newbros are nice, but maybe they can get some AG tears about them killing newbros. So yeah, bottom feeding. The Retriever pilot of tomorrow is the Venture Pilot of today. especially when its a ship ccp gives them for free.